Blues defenseman Kevin Shattenkirk is on the mend. Two of the Blues' walking wounded, Robby Fabbri (concussion) and Kevin Shattenkirk (lower-body injury), could be back in the lineup soon if their presence in practice is any indication. Both Fabbri and Shattenkirk skated in practice on Friday, a promising sign ahead of Saturday's game against the Islanders. Fabbri has been out since Oct. 10 while Shattenkirk has not played since Oct. 13. Any improvement on the injury front will be welcomed by the Blues, who lost Paul Stastny for at least five weeks to a broken foot. 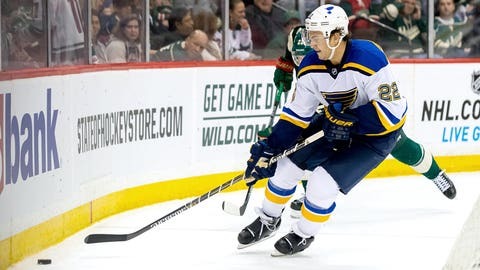 The team is also missing center Patrik Berglund, who will be out for a few months following shoulder surgery late in the offseason after he re-aggravated an old shoulder injury. Fabbri on ice for Friday practice. Shattenkirk too.